Carl's Jr recently announced their new freshly prepared Hand-Breaded Chicken Tenders. These appear to be slightly different, but mostly the same as the Hand-Breaded Chicken Tenders that have been selling at sibling-chain Hardee's since about June. My own local Carl's Jr has been carrying them for about a month. It is unclear if "freshly prepared" means made-to-order or just made in-house throughout the day and left to warm. Probably the former since it does take some time to cook breaded chicken. The selling point on these chicken tenders is that they are hand-dipped in buttermilk and lightly breaded in-house daily rather than shipped frozen and pre-cooked to each restaurant before a final dunk in the deep fryer. Retail pricing stands at $2.99 for a 3-piece order or $4.49 for a 5-piece order which compares quite well to other fast food chains as well as the fried chicken chains. They are also available as part of a combo or kid's meal. Sauces are available in honey mustard, buttermilk ranch, and barbecue. 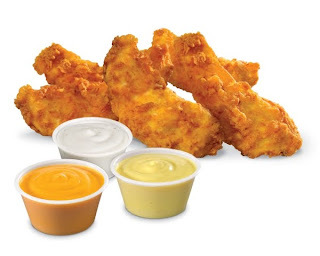 There's an available online coupon for a free small drink with the purchase of a 3-piece order of Hand-Breaded Chicken Tenders. Do you notice any difference between the Carl's Jr and the Hardees ones? Carls Jr Hand-breaded chicken is the most nasty disgusting gas-inducing, sorry excuse for CHICKEN I have ever had. The juciness of the chicken was more like greasy and the flavor was DISGUSTING I am totally gassy sick and have a stomach ache as a result. EWW EWW EWW CARLS JR: STEP IT UP YOU ARE NOT GOING TO INCREASE BUISNESS UNLESS YOUR FOOD IS OF BETTER QUALITY!! VOMIT ALL OVER THE INTERNET = carls jr hand breaded chicken EW! While I can't be sure as I haven't tried either and Hardee's isn't anywhere near California, the nutritional information and description suggest some differences. Carl's Jr. apparently doesn't use egg to help adhere the breading to the chicken and the chicken seems to be slightly bigger or you get more of it by weight. Also, there seems to be some differences in the seasoning according to nutritional information.